This blog, and the Internet in general, has enjoyed watching the Los Angeles local news stations cover the NHL’s Kings during their ridiculous run in these playoffs: There was the time one of them showed the Sacramento Kings logo in an on-screen graphic and the time one of them showed footage of the Sacramento Kings mascot during a hockey segment, and, of course, there was this awkward clip that included, among other things, a reference to someone named Brad Doty. (Even the Kings felt compelled to whip up an infographic to assist/mock the city's local news outlets.) Meanwhile, a station in Miami used the FIU athletics logo after a first-round victory by the NHL's Panthers. But we’d hoped the local stations in New York — an Original Six city — could avoid such mistakes. 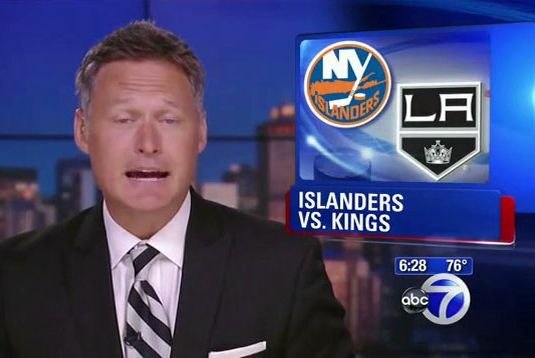 Well, they couldn't: Via Deadspin, that’s a screenshot from last night's six o'clock news on Channel 7, which indicates that this Stanley Cup Final is being played between the Kings and Islanders. Right sport, at least, but wrong metropolitan-area team. Deadspin calls this the most inexcusable mistake of the whole bunch, but we think it's about even with the L.A station using the logo of an NBA team in a graphic. After all, the Sacramento Kings had roughly the same chance of making a deep run in the Stanley Cup Playoffs this year as the Islanders did.